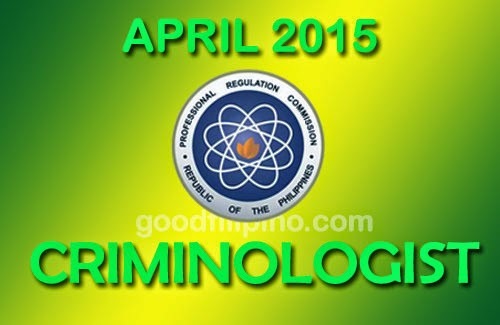 Congratulations to all passers of April 2015 Criminologist Board Examination. PRC and BoC released the exam results today. Please scroll down this page for more details. PRC and the Board of Criminology conducted the said exam on on April 7, 8, and 9, 2015, after the Holy Week 2015. The Criminologist Licensure Examination was held on Manila, All Regional Offices (except Pagadian), and Zamboanga. The Top 10 Passers (Topnotchers), Top Performing and Performance of Schools will be posted online as soon as available. Last year on October 2014, the Criminologist board exam results has a total of 12,245 passers out of 28,187 examinees in just twenty six (26) working days. Comments or suggestions about "April 2015 (Alphabetical) Criminologist Results: E – F – G – H" is important to us, you may share it by using the comment box below.